This is the simplest notepad in the world, notes on the fly.Nothing extra, no ads, loads instantly. Notes is an intuitive, lightweight notepad application that allowsyou to capture and organize your ideas. Supports import/export,pattern screen lock features. [The basic features of this app ] 1. Common feature tutorial 2.Drawing mode(paint board) * Loading a picture : Bringing a photo tokeep the aspect ratio, Bringing a photo to fit the screen, Bringinga photo to set background. *Sort of pens : normal pen, eraser,spray, paint bucket, earthworm, highlighter, shadow pen,two neonpens, shaping tool. *Magnification function : Using two finger tomagnify or curtail the paint board. *Coloring : Supporting defaultcolors and Custom colors, able to change background color. Andtransparancy can be set. *Sharing : Sharing a drawing via variousapps. *Saving : Save the drawing to opaque image or transparentimage with two file type : png, jpg. *Undo, redo : It can bereturned when you mistake on drawing. *Inserting text 3. Notemode(notepad) *Loading text file : able to load a text file tonotepad. 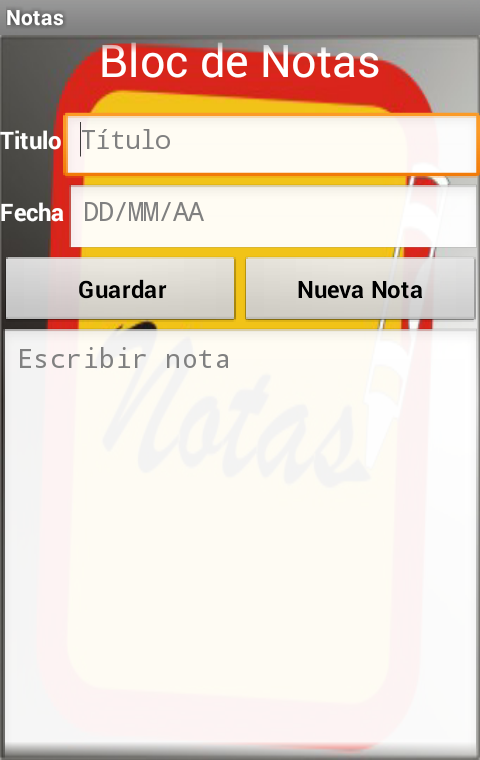 *Able to save the note in the app, or save as text fileand image file which is screenshot of notepad. *Attaching a pictureavailable. *Sharing the note via various apps. *The note'sbackground color can be set with transparency. [Detailedexplanation] 1. Tutorial : It is an explanation about this app'sfunction. 2. Paint board function *Bringing a photo : There is 4ways to load photography : Bringing a photo to keep the aspectratio, Bringing a photo to fit the screen, Bringing a photo to setbackground. Also It is convenient to use because you can cut thepicture when it is set to background. And you can set itstransparency so, it is possible to draw a picture to imitate photo. *Sort of pens or tools. Normal pen : you can draw a picture fellnormal pen. Eraser : you can set its size and erase the picture.Spray : This is unique tool of this app. Feeling actual spray, youcan be given much fun. Paint bucket : With one touch, you can colorthe area which is surrounded with lines. Earthworm : The earthwormfunction that was discovered accidentally during development is afeature that is attractive once it is used. Highlighter :Literally, It feel a highlighter. Little transparent so that youcan emphasize the area. Shadow pen : This guy is only one existingin this app. Along the line, it cast a shadow. Neon pen 1 : Givingthe neon effect. Inner of line is dark, and outer of line blinkingthe light. Neon pen 2: Giving the another neon effect. Inner ofline is bright and outer of line is dark. Shaping tool : You canselect the shape : Square, triangle, line, circle. Of course, youcan adjust the effect we have seen before. *Magnification : If youwant to draw elaborately, just widen or narrow your two fingers. Ofcourse you should use two finger when you moving the paint board.With your one finger, picture will be drawn. *Color : There are 30normal colors. And there are custom colors which are your owncolors you selected. In custom colors, there are empty palettes.And you can save the your own color by touching the empty palettes.One more thing! You can set color with transparency. Each time youadjust the transparency, the colors of the palette are adjusted fortransparency. *Sharing : You can set the name of drawing, its savedirectory, and share the drawing via various app to brag of it! *Saving : There is 3 way to save. Saving as opaque png, jpg files,or Saving as transparent png file. If you want to save it opaque,it will include background. And saving transparent, excludebackground. *Undo, redo : If you can not draw a picture well, youcan go back to before you draw it. This can be undone if you do notwant to rotate the screen. 3. Notepad function *Loading text file :You can load a text file to notepad. Just like computer notepad hasthese features, this app does the same. *Saving : There is 3 waysto save note. Saving as text file, image file(jpg, png), and savein this app. *Attaching a picture : you can attach a photo if it isneeded. Of course, it is possible to magnify or curtail by touchingphoto. *Sharing : You can share the notes to message app or emailapp. Notepad is an easy-to-use free notes app for Android, optimized forafter-call note taking. This clear and simple notepad app allowsyou to make quick notes and checklists to help organize your lifewith great ease. SIMPLE AND CLEAR ✔ This quick notepad allows youto sort notes by date or title to help you keep them in order and auseful search function will help you find specific notes if youhave many saved in your list of notes. SHARE AND CONNECT ☝ Allnotes can easily be shared with others via your email account orvarious social media platforms, and a smart link to phone callsallows you to write notes or memos immediately following everyphone call made or received. Connect all aspects of yourcommunication with this smart Notepad app! ORGANIZE YOUR TASKS ✍The useful checklist function allows you to create clear checklistssuch as to do lists, shopping lists or task lists, and also allowsyou to cross out items on the list when they are completed withouthaving to delete them, in case you need to refer to the originallist later. SMART CONNECTION TO PHONE CALLS ✆ Following every phonecall Notepad is activated on your phone, allowing you to quicklymake notes so that you don’t forget anything important from thecall. An advanced Caller ID feature also displays detailedinformation about the call. Details such as caller name, number,time and much more are displayed and serve as a useful reminderwhen making notes. NOTEPAD KEY FEATURES ✎ ✒ Clearly presented noteswhich can be sorted by time or name. Quickly and easily edit, saveand delete notes at any time. ✒ Easy checklist function wherecompleted items can be marked as ‘done’. ✒ Useful search functionfor those difficult-to-find notes to save time. ✒ Backup &restore notes so that you don’t lose any important notes. ✒ Quicklyshare notes with others via email, SMS or various social mediaplatforms including Facebook, Twitter, Instagram, WhatsApp,Messenger, Skype and LinkedIn. ✒ Create notes quickly followingphone calls with a handy quick link to Notepad after every callmade or received. ✒ Identify unknown callers with the advancedcaller ID feature and see detailed call information - useful whenmaking notes after phone calls! For your privacy and dataprotection we do not have access to any of your notes or store anyof the information contained within them. Therefore, we recommendthat you regularly use the useful backup feature on this app toavoid the accidental loss of any important information. InstallNotepad today and organize your life with this easy-to-use notepadapplication and enjoy a hassle-free time. Never be stuck without apen and paper again! Notes is a good helper to manage your schedules and notes. It givesyou a quick and simple notepad editing experience when you writenotes, memo, email, message, shopping list and to do list. It makesto take a note easier than any other notepad and memo apps. Youalso can cloud sync notes to the Google task. Let your notes moresimpler and securer. Key features: * Add sticky note widget to yourdesktop, easy to open and edit your notes. * Can be organized infolders, easy to classified your notes; * Add Checklist for To dolist & Shopping list * Five kinds of notes background coloravailable to change, make your notes in personalized way. * Changethe Font size; * Transform your note into a checklist view; * Setreminder to your notes, no longer missing you important things; *Auto-saved. You don’t have to do anything to save them. * Shareyour notes via e-mail, SMS, and etc. ; * Backup/export to SD card *Import backup notes files. * Sync your notes to Google task, letyou sync/backup online. More advanced features, please download toexperience!